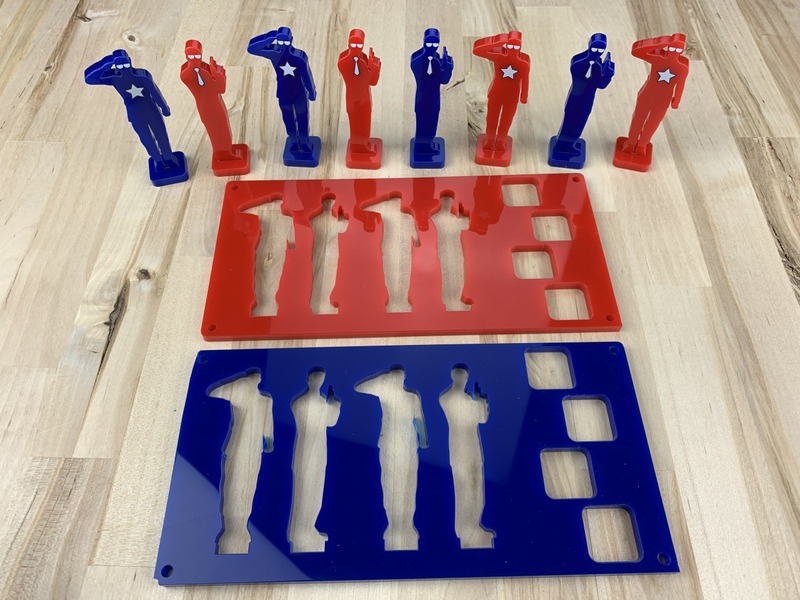 Board game designers can now create their own 100% custom acrylic game pieces! In the past we’ve allowed you to make custom punchouts, stickers, cards, and other printable components all to your exact specifications. For the first time we can now do that with plastic game pieces. You’ll start with a piece of 8 inch by 4 inch acrylic. You can choose from 2 thicknesses (1/4″ or 1/8″) and over a dozen colors. You can choose what shapes to cut from the plastic, and you can print in full glorious color on both sides of it. Watch the tutorial below to learn how to make your own Custom Acrylic Shapes. Now that you watched the tutorial, you can visit the product pages below to download the template and get started creating your own acrylic game pieces! When making your SVG files for our 1/4 inch (6mm) Acrylic Shapes make sure your nicks are .005". When making your SVG files for our 1/8 inch (3mm) Acrylic Shapes make sure your nicks are .01".